I stayed up a little later than I should have last night to finish this dress. It was a relatively quick project, taking about three hours total, including cutting out the pattern and fabric. This is a super simple pattern and only has three pieces since I used seam binding for the contrasting trim: front, back, and bottom band. 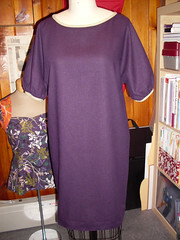 The dress has Dolman-style sleeves that are cut as part of the front and back. See the technical drawing here. The fabric gets wrinkled very easily, but I love the color. My favorite thing about this dress? No fasteners, it just pulls on over your head! See more detailed photos here and here. PS Thanks to Mariko for the cute seam binding! Really nice! I bought this pattern last night at Joann's $1 pattern sale.